These Korsteel safety irons are made from a high quality stainless steel. 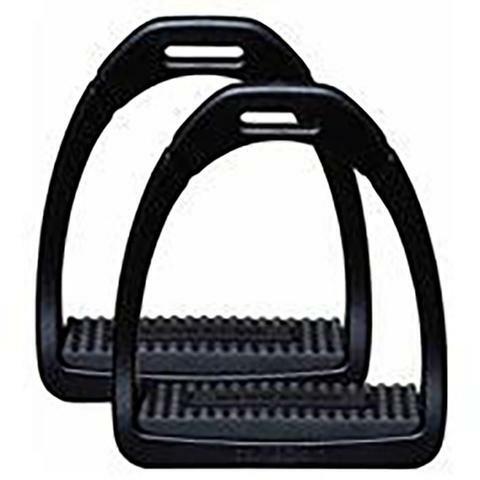 These are Swan/Bent leg stirrup irons which are purposely shaped to allow for the riders foot to be released easily in case of a fall. 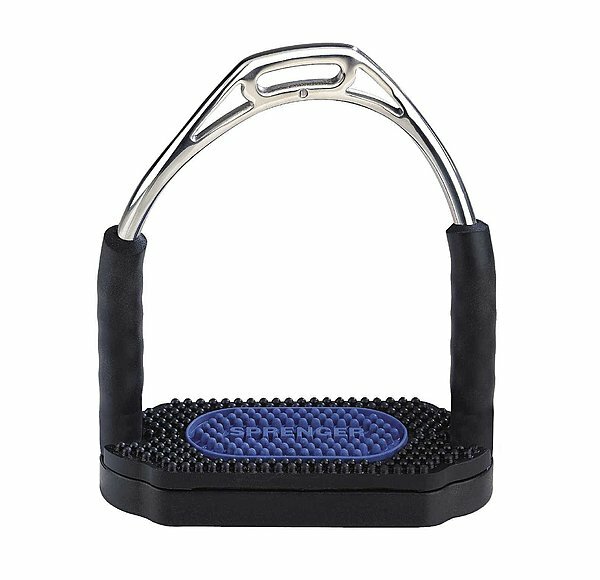 These Korsteel Peacock Safety Stirrups feature a quick release rubber band that disconnects in the event of a fall, and therefore less likely that the rider’s foot will get caught. These stirrups are perfect for children or beginners and come in 6 different widths. 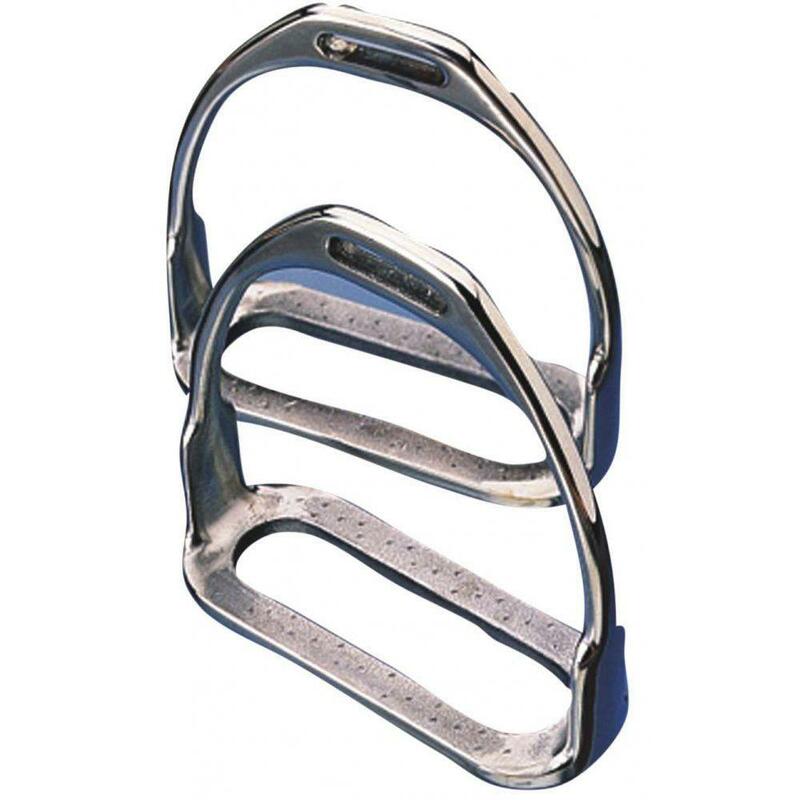 These Korsteel Flexible Fillis Stirrup Irons are a stainless steel stirrups that allows forwards and backwards movement helping to relieve pressure on riders joints and also aids correct leg positioning. The Safety Tech Stirrups “Venice” have a unique and revolutionary magnetic mechanism positioned on the tread. 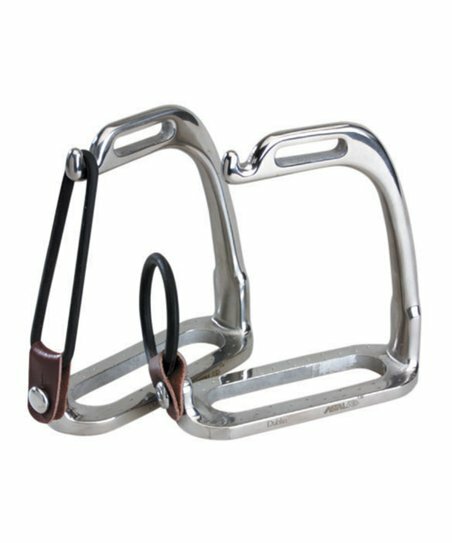 This allows, in case of an emergency, the opening of a ring portion, allowing your foot to escape and not get caught in the stirrup. After which the mobile part automatically returns to its original position. This prevents dragging and potential fatal accidents.The mobile part is hooked to the tread and joined to the ring by a magnet that does not allow it to move during the work but allows it to open only if a certain weight load is exceeded. 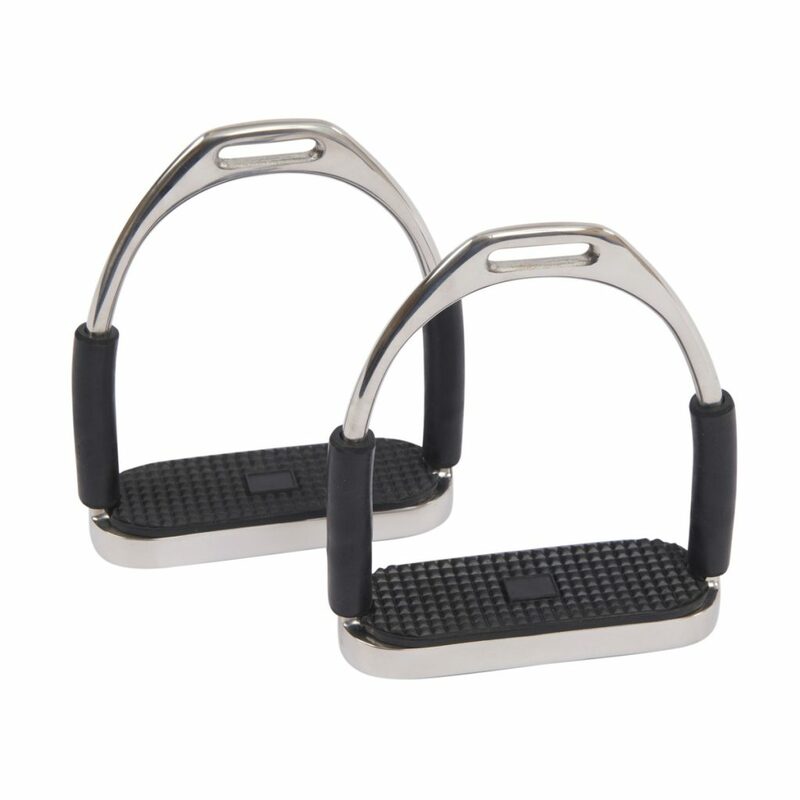 These Compositi Premium Profile Stirrups are elegant, lightweight and strong. 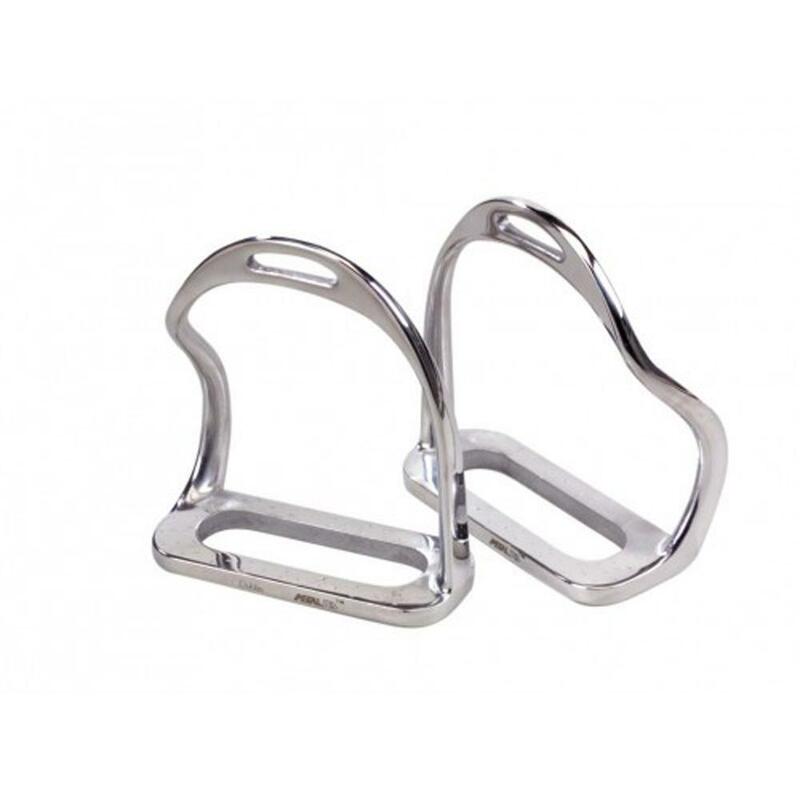 The sleek Premium Profile Stirrup can be customised to coordinate with the rider’s colours . Reinforced grip, high resistance to stress, interchangeable coloured tread. 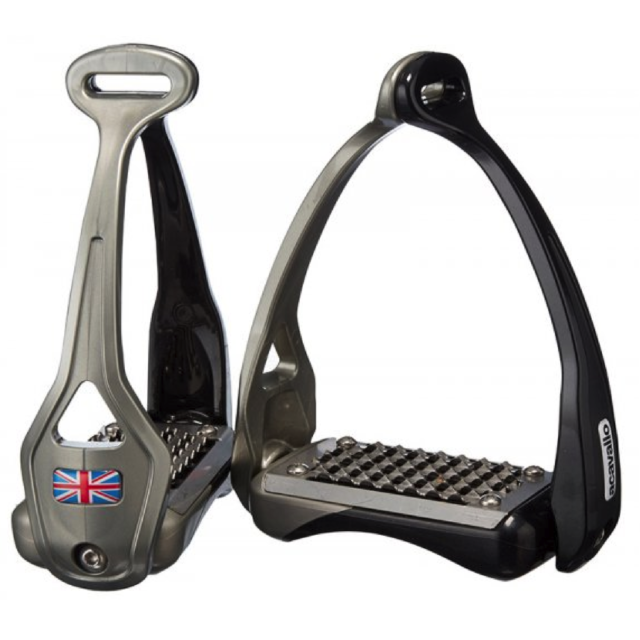 These premium stirrup irons are designed by Compositi, a Belgian company who specialise in lightweight technical equestrian products. We sell them in black. • The new dimension of stirrups supreme comfort and maximum security.• The bow that puts you on a winning curve.• The new design ensures improved leg position. Changing the weight ratio on these stirrups results in perfect balance and greater comfort for the rider.• Shock absorbing grip is achieved by a widened tread made of rubber with two types of properties. The internationally renowned System 4 technology used in these stirrups enables immediate release of the foot in case of emergency. By flexing in four directions impact on the rider´s cartilage and ligaments is softened, without feeling unstable. Bow Balance design provides easy „pick up“ upon mounting as they require very little effort on the rider´s part – a simple touch of the foot to the stirrup and it gently folds onto the rider´s foot. 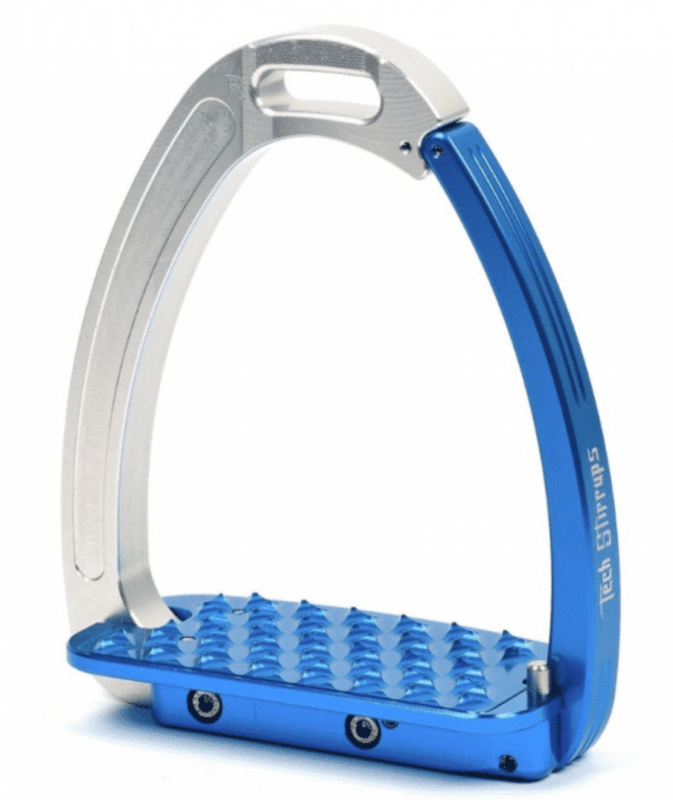 Blue elements on these stirrups enable instant recognition that the rider has invested in security and comfort. 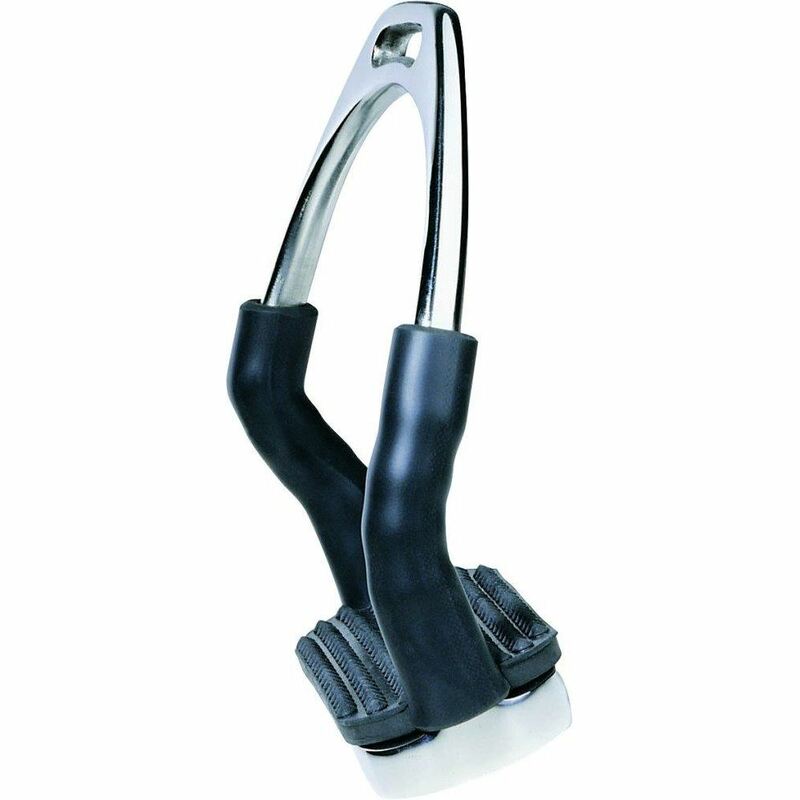 Sprenger jointed stirrups have a tread surface that moves forwards and backwards putting the heel of the rider in the desired deep position. In the case of a fall, the rider’s foot is released with considerably more ease than would be the case with conventional stirrups. The joint enables the adaptation of the tread surface to the foot movement of the rider that so there is a constant contact to the sole. The result is a very good foothold and relaxed calves, which explains its great popularity among show jumpers and cross country riders. However, it has also become increasingly popular among dressage riders. It relieves hips, knees and ankles while riding and is particularly gentle on the ligaments and menisci. To this day, the patented System 4 Jointed Stirrup is the epitome for riding in comfort. It provides unquestionably great confidence and is used by both leisure and professional riders. Made of rustproof steel, with black rubber tread. Gentle on joints and ligaments. The Opera stirrup is a completely new concept in riding because of its special patented loop construction, which allows the stirrup to adhere to the saddle flap, avoiding friction between the leg and the stirrup, for a more correct, comfortable and secure ride. 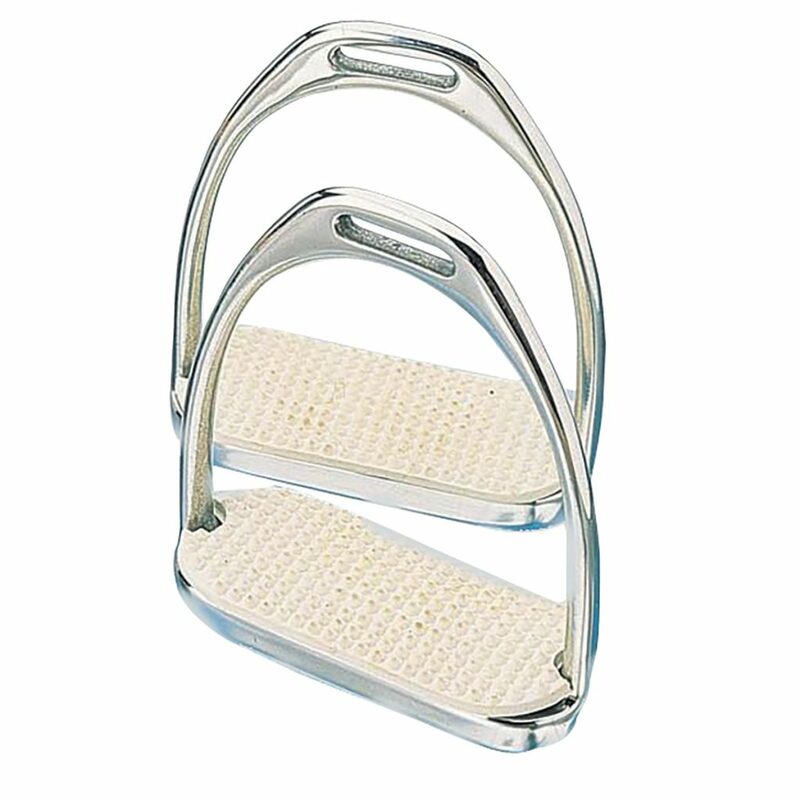 The large stirrup pad in stainless steel gives riders better grip and relieves tension in the hips, knees, ankles and calves. Made of composite material in injection, it is available in two-tone and bright colors.